No two properties have identical needs, so we customize every security strategy to best fit your own. When you call in DAWGS Door and Window Guard Systems, we quickly and thoroughly assess your property before offering you a quote that includes all of our signature services. Our flexible, trained installation teams can be at your property whenever you need them, ensuring that you aren’t left vulnerable waiting for reinforcements. We carefully document the entire installation process, giving you the peace of mind that only comes when every accessible entry point is completely secure. Because DAWGS use a one-of-a-kind, patent-pending installation system, our installation teams are trained to effectively seal every door and window without causing any damage to your property. Whether you need to call off the DAWGS temporarily or permanently, our fast-response crews can be on the property whenever you need them. The proprietary design that makes our door and window guards so secure ensures that only our trained crews can remove them, and we always document the process to make sure that your property is never damaged. Need your DAWGS taken down for just a short period of time? Our crews can be on site in 24 hours for all of your removal and reinstallation needs, with minimal cost to you. The superior service you get with DAWGS doesn’t end with installation. Our inspection teams visit your property regularly to ensure that it’s still secure, so you don’t have to. We document and conduct any necessary repairs and modifications on the spot, keeping security as tight and hassle-free as possible. And if you ever have a question about your DAWGS or need someone on-site for an inspection, we’re there at a moment’s notice. You shouldn’t have to choose between strength and service—when you protect your property with a DAWG, you get speed, security and accountability. Want a draft-free seal for winter? Our DAWG winterization services safely and quickly insulate the air-circulating holes in our window guards, keeping your property warm and dry when the temperature drops. To learn more about our fully customized security solutions, click here to contact our rental services department, or call us at 1-877-88-DAWGS (32947). 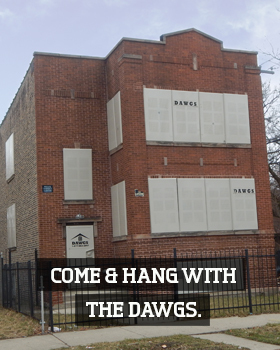 DAWGS manufactures & rents steel panels used to cover door and window openings on vacant buildings. 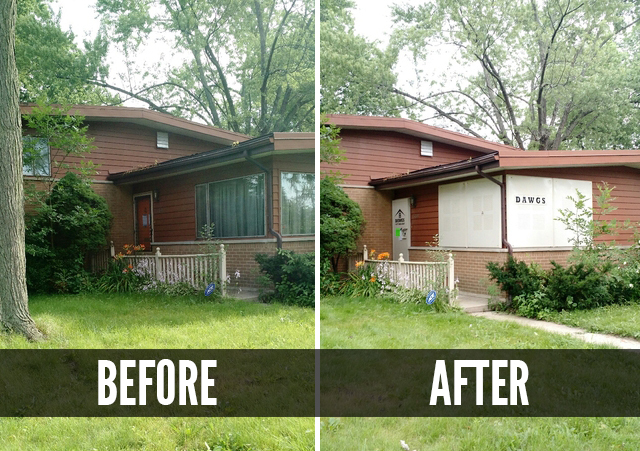 Our guards provide vacant property security to property owners and neighborhoods from the many problems associated with vacant property.